There are generally two types of RFID tags: active RFID tags, which contain a battery, and passive RFID tags, which have no battery. 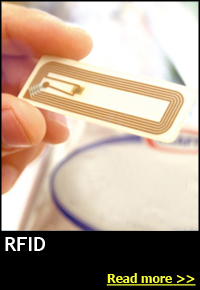 Future Chipless RFID allows for discrete identification of tags without an integrated circuit, thereby allowing tags to be printed directly onto assets at a lower cost than traditional tags. As of 2008 none of the chipless concepts has become operational. Today, RFID is used in enterprise supply chain management to improve the efficiency of inventory tracking and management.